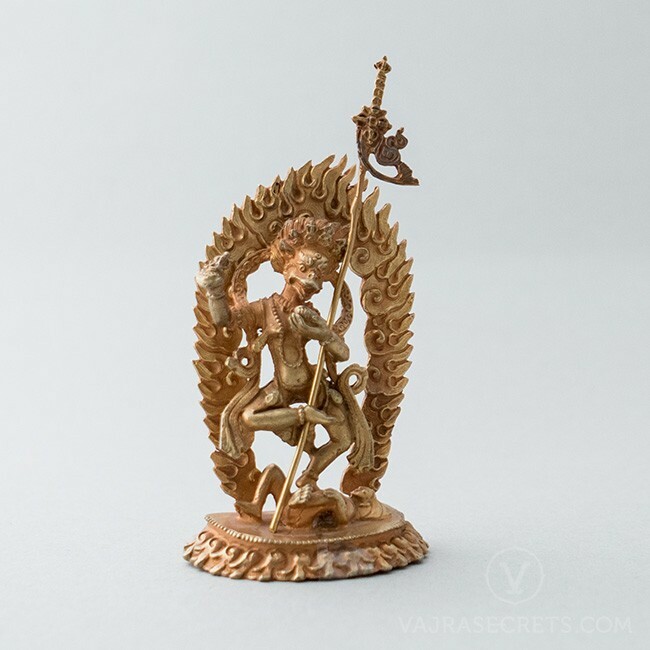 An exquisitely hand-carved gold-plated statue of the Lion-faced Dakini, Sengdongma, who provides powerful and effective protection against negative conditions, illnesses, misfortune, spirit disturbances and black magic, particularly those specifically sent against us. 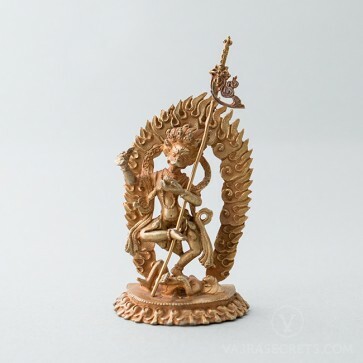 A gold-plated copper statue of the Lion-faced Dakini, Sengdongma, exquisitely hand-carved by master craftsmen with full iconographic detail according to traditional scriptural sources. A perfect addition to a small shrine at home or in the workplace, or as part of a portable travel altar. Sengdongma is a female Dharma Protector regarded as a wrathful emanation of Guru Rinpoche or Padmasambhava. Amongst all protectors, she is the most effective in clearing spirit disturbances and black magic. 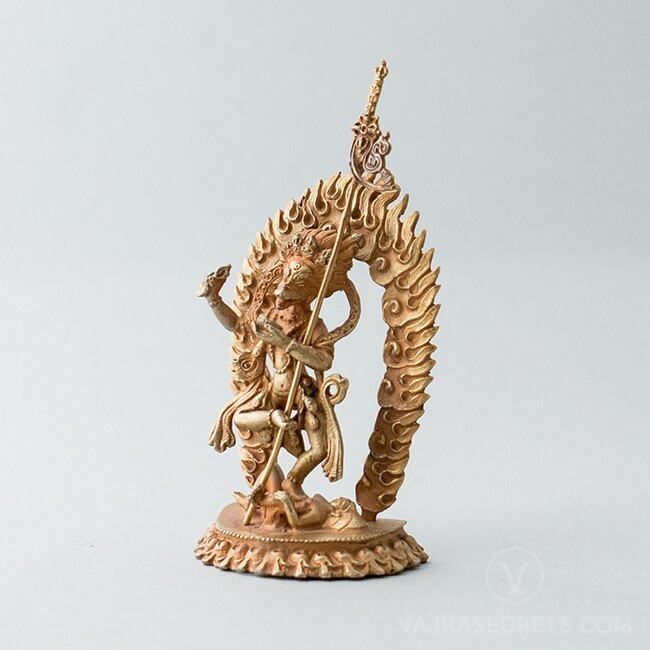 Her practice is also excellent for destroying obstacles to Dharma practice ensuring the tantric practitioner’s health, wellness and spiritual progress. Sengdongma has one face and two arms, and her body is dark blue in colour. Her wrathful lion face is white and slightly turned to the right. Her right hand holds aloft a ritual chopper and her left holds a white skull cup filled with blood to her heart. She carries a khatvanga staff in the crook of her left arm. She is adorned with a tiara of five skulls, bone ornaments, a necklace of fifty freshly severed heads and wears a tiger skin skirt. She stands on her left leg with her right leg drawn up in a dancing posture in the middle of a blazing fire of pristine awareness. Her quick, intense and vibrant energy clears the most pervasive and malignant obstacles, especially spirit disturbances and black magic. She and her entourage of 60 million strong provide powerful and effective protection against negative conditions, illnesses and misfortune, particularly those specifically sent against the petitioner. This Sengdongma statue can be personalised with a hand-painted face using real gold dust or insertion of mantras and holy items. One can also offer brocade, pearls and semi-precious stones, as H.E. Tsem Rinpoche always encourages the practice of making offerings to the Three Jewels, which creates the causes for us to attain the six paramitas (perfections).